Manipur State Coordinator Lily addressed HIV+ MOMS at the Drop In Centre @ Imphal. Chennai HIV+ Network also had a Silent March and a CORPORitual Empowerment Workshop . Ajmer HIV+ Network had a Silent march. In Bangalore, the IT Heart of the Country, hundreds of top notch corporates gave back to the RBGCDat a heart touching Engagement. The volunteers included individuals who are successful in their Work Life and have a Compassionate heart to reach out through their organizations & Teams. Various experiential programs were organized that focused on learning a new skill, showcasing ability and experiencing success as a collaborative. The children were equally eager to learn and gave in their 100% in their learning experiences. Children were from Parikrma Humanity Foundation, Shishu Mandir, Mitrajyothi & People’s Trust. The learning design included Leadership Modules experienced through Theatre, Movement, Advertising, Photography, Scientific Inquiry, Story Telling, Art, Foot ball & Basket Ball. The Learning specialists were carefully handpicked by the SPF TEAM were individuals who were specializing & passionate in their domains to share with children from their experiences. Top notch Corporates who offered a day of Service through the RBGCD May 10th event were lead by 10 visually impaired girls from Mitrajyothi. In its first step to reach out to the Police and support them in their lives to help balance their well being and productivity, RBGCD was the first step to reach out to the Karnataka State Reserve Police No 1 Battalion, Bangalore. Ever since, the CORPORitual Values Of Living Essence has reached out to thousands of policemen & their families in Karnataka a total reach out of 65000 lives in the Karnataka State. 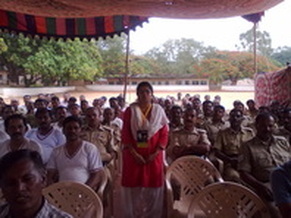 The CORPORitual Workshop was very helpful for the KSRP Police as they felt relaxed. They learnt more about connecting to themselves and their families and taking care of their bodies. It is essential in today’s lifestyle. RBGCD in Kakinada Burma Colony reaches out to 100 needy individuals. 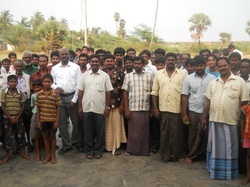 Jollarpettai Slums reached out as 15 children embrace CORPORitual as a new way of Living. Jamshedpur RBGCD senior citizen volunteers reach out with food to slum dwellers. Pune Volunteers reach out to Slum Children to feed and spend time with them. RBGCD Kolkata Volunteers reach out to 32 under served individuals at Bansdroni. Asansol Slums reached out during RB-GCD. Retd Govt Teacher helps children with food and stationery on May 10th. RBGCD reaches 200 individuals in Mallarpur Slums in Hyderabad. Bangalore Murphy Town Slums and Lakshmipuram Slums reaches to 75 children. RBGCD Chennai Volunteers reach Fisherman’s Slum to help Elders & Tsunami Survivors. reaches out to slum children as mothers have an interactive class. I really enjoyed today’s RBGCD experience and this is something I have wanted to do for a very longtime. The interactions with the Blind children were moving. Being part of the RB-BTS Team felt positive and open and I really appreciate the efforts of Sri Raj Bhowmik and would like to say Thank You. Every leader should have compassion. The more compassionate you are, the better leader you are. Roses are not human beings. If not offered a price tag." Compassion is not necessarily giving gadgets and materials. When you give, you get back. Ruby Singh: (CIO, Madisson Media) The RBGCD Day was a memorable & enjoyable experience and it was great to see children improvise. It was so good to see so many people, positive vibes and everyone doing things together. It was great to be here through a purpose. Thank You Raj. There were 2 rallies in the slums of Ram Tekedi & Tadiwada in Pune. About 250 people participating spreading the message of safe living during the RBGCD day was a great opportunity to participate in this Global Cause. There were nurses, doctors, beneficiaries and it was a good feeling. We will be participating every year as part of this RBGCD Day. The women seemed happy as they could share with children and be part of the community. Next year we want to make it bigger. Today was special. In my fasting I also included other people and fed them. I felt good. We went to the leprosy hospital and then fed the beggars Puri & Sabzi . We spoke to their families at the Leprosy centre and understand that their families don’t take care of them. Atleast we could do something for them that day. I feel useful. Thank You Raj. We observed the day by gathering HIV+ women at our drop in centre, we read CORPORitual Values, understood our empowering spaces together in the state. I also reached out and organized a meal that was nutritious for the women. This going out of my way and doing something for another felt compassionate. We felt very good as we cooked food and distributed with our own hands. We gave food to lepers, beggars in the slums and everybody felt included. I hope and pray for Blessings like this everyday. The heart touching Orientation about the RBGCD Day and Purpose set the day for us to dedicate ourselves to others. The kids in the group were creative. This is such a large scale Project to help humanity and I felt good being part of it. RBGCD Day – An Act like this every year is worth it. The RBGCD Day Platform is such a wonderful platform where different people come together doing different things but with one Pulse Compassion in their hearts. I felt Oneness and I learnt trust from the visually impaired girls. I express my heart felt Gratitude to Sri Raj Bhowmik to help me be part of such a beautiful change. This is the first RBGCD Day Experience and truly a unique experience. Connecting to diverse children all under one roof was unique. The RBGCD platform is a huge success. It is expanding on its own through Action. Participating in the RBGCD Day is truly a great experience. I was so happy to see the turn out and everybody giving the children in their own way. I thank Sri Raj Bhowmik for making me part of this beautiful aspect of Life. This has been like a new day in my life in the last so many years. When so many people joined the RBGCD Day, it felt as if we are all doing it together for humanity. The RBGCD Day is an opportunity that people have taken and it is an awesome feeling to drive a Global Project. Thank You Raj. It is one of the best days of my life. We are very thankful to Raj and this opportunity on the RBGCD Day that in the midst of a packed working day, as the cause was noble and global we could make the time to go out and make a small difference in our way. We took 150 Bisleri bottles and distributed it at a construction site and listened and talked with them. It was a beautiful feeling. The RBGCD Day has been a wake up Call being part of this Global Vision of Sri Raj Bhowmik. The children in the Drama Group were very easy to connect with, playful and accepting. There was so much of mutual respect between all. Thank You so much Raj. The RBGCD Day was moving. It was fantastic. There was so much of love around to feel and give. It was good to look at the ways learning happened in groups. The RBGCD Day is a great initiative and I am happy to be part of it and I am happy to contribute in ways that I can. The Volunteers came from all domains of life, children focused and it was so good to be part of a global initiative. The RBGCD Day was a good feeling from the heart that makes me peaceful. This platform and opportunity is very rare where as individuals we can contribute to a broader level. The RBGCD Day was very well organized and well coordinated. Thank You Raj. There were like minded people whose single agenda was to help. It was a calming and peaceful and I felt one with all. There was no difference. Thank You Raj for making me feel this oneness. Spending time with the children on RBGCD Day with learning was awesome. The group was smart, could tell stories. Thank You Raj and I would like to be part of this RBGCD Day every year. It was great to know kids and understand how hey are growing today. It was relaxing and at the same time a noble cause. Sri Raj Bhowmik’s cause is to allow people and not limit themselves with their skills and abilities. He is doing a great job. Thank You Raj. During our Basket ball interaction with the kids we got to se different types of children. Children are so aware these days. The RBGCD Platform makes us give and it is increasing every single day. Thank You Raj for creating this wonderful platform, it is a space to each to learn. I thank Him for the opportunity. The RBGCD Day was a moving experience to realize that people are so open to receiving. I found openness and gratitude. There was a sense of belonging and I felt a huge sense of responsibility and a sense of connection to my society through this day. Our family was able to feed the people working in our apartment complex. It was getting into action something I have always wanted to do at the family level. Thanks to Raj. The RBGCD Day completely dedicated itself to children. We don’t get this opportunity to give ourself so whole heartedly in our busy lives. It has been an enjoyable experience, being together, interacting with the kids. I am very grateful to Sri Raj Bhowmik for this opportunity and this is only a beginning from me. I am amazed at the number of people who took off on a week day to make time for a Global RBGCD Day Cause. It was heartening to see how we all want to give back. The kids showed wonderful participation. SPF is the only organization that gives an Opportunity to serve to people who want to associate with good work. I would like to say Thank You to Raj for this wonderful platform to give, connect & bridge the gap. Swaati Birje (Special Educator & SAHHEAL Healing Consultant): The children were so hopeful and they knew many more things than what we expected. There was a space for everyone to give their best in their own ways. Soulbath Peace Foundation had now expectations and allowed everyone to wholeheartedly give to children. This leaves me with a humble and generous feeling. Thank You Raj for your generosity. Thank You for choosing me to give in this way. I loved being with the children and it was a positive feeling to be part of the RBGCD Day. I thank Raj for thinking about a platform like this one. Thank you Raj for giving me the opportunity to be part of the Raj Bhowmik Back To Society Day. I believe experiences are much greater than any number of words. To experience sharing at such a large scale does touch at a very physical level. Lot of times I have wanted to do it but it is not easy to organise such events at such a grand scale so thank you for ing about such a day. I am also happy that the number people wanting to be a part of this event has been steadily increasing and this will event will definitely touch many more people in the coming years. It felt beautiful to give. So many people, the largeness all with one intention moved me. I thank Raj for letting me be a part of this experience. It was so natural and I felt good. Somewhere peace and harmony on earth seems to be a reality. I am feeling blessed. It is a feeling of connection with so many people beyond one’s mind. It is really good to be part of the RBGCD Day every year. I am very very thankful to Raj and feeling blessed to be part of this day. We went to Anbu Illam in Yercaud and it was a nice feeling to give even in our holidays. I feel fortunate and overwhelmed and thank Sri Raj Bhowmik for this opportunity to connect with SPF and do something so meaningful & fulfilling. It was moving to see my small kids serving food to the elderly. The RBGCD Day is a day of awakening an awareness that broadens from an inner space, expands from you towards society that we live in. This has been a wonderful learning experience. Thanks to Sri Raj Bhowmik for giving me this moving opportunity to serve children. The RBGCD Day felt humanity connected together. There were no strangers and everybody felt like one place. I am extremely thankful to Raj for giving me this opportunity to experience this first hand. The RBGCD Day has been a moving and significant experience today. Working with the disabled I realized how it is important to appreciate what we are. We all want to give back but most of the time don’t know how to. I was given this RBGCD Platform to Work and contribute. I am eternally grateful to Sri Raj Bhowmik for giving me an opportunity. The RBGCD Day has been a very satisfying & a moving experience. I feel like a small drop in a big ocean and the joys received are ever lasting. Thank You Raj for creating this opportunity to being part of this day and contribute. The group that I worked with comprising of visually impaired girls touched me the most. They were able to visualize and were extremely talented. The RBGCD Day has more people this year. I thank the platform and congratulate Raj on his vision. The whole experience was very moving. The RBGCD Day enriched everybody along who participated. Thank You Raj for giving me an opportunity. The Silent Introspection in the morning started the whole day and we spent a lovely time. I am rejuvenated as I came back. The children hugged, asked questions and were so involved to communicate. I would like to get involved more in the RBGCD Projects and I thank Raj for giving me this opportunity to be part of this heart touching day. I was so comfortable and wanted to reach out more . The children were really good. It is a gratifying experience. Thank You Raj. It was wonderful when the kids called us “Anna” which means big brother. This RBGCD Day experience is heart touching. The RBGCD Day is a humbling experience. The more we see and give, the more we want to give. I am grateful to Raj for this deep connection. Thanks You Raj. It was a very positive experience moving with children through the RBGCD Day experience. As part of the RBGCD Day we visited a women’s shelter home in Bangalore. We served lunch and whatever time we spent was worthwhile. I have been thinking of this for the longest time but an opportunity at such a large level makes us Do it. We give excuses on normal days. But RBGCD Day and the platform provided by Raj helped me actually to do what I always wanted. It is a different experience to see how so many people from different backgrounds come together. I realized how there is no age to learn and teach. Thank You Raj. It was my pleasure and luck to be a part of Raj Bhowmik Back to Society Day. When I was told about it, to the time I was leaving for it, I wasn’t every sure, as too how is it giving back to Society? However, once I became a part of it, I understood every bit of it. I can’t thank Sri Raj Bhowmik, enough for starting such an amazing thing. There was a lot that I learnt from it and I am sure, I will be a part of it in all the coming years too. Spending time with children and seeing their enthusiasm was such a big learning. I was a part of Art Group and we were here to teach the children WARLI ART. He amazing part was, that the girl, who knew the art was also an eleven years child. Working with her was a different experience all together and there is so much I learnt from her too. The team was good and every one participated with a lot of energy and hope. It was an amazing experience and learning and I would want to thank you from the core of my heart for giving me this opportunity and would be a part of it forever. I am also attaching some pictures of that day, that I could click for my collection. Thanks so much again for giving me this opportunity and looking forward to be a part of Soulbath. The RBGCD Day was a heart touching experience. Not a single child was depressed and they were so cheerful. I have happy because our 5.5 month Vedant could also be part of this. I would like to thank Raj for this opportunity and to live Compassion so deeply and letting go judgments. The RBGCD Day is a good platform to give back as it makes us aware about our connectedness. I have learnt so much today being with others at the RBGCD Day. There is so much to take from children and give back to them and ourselves. Being a Lead Volunteer on the Bus ride, I was geared to give my 100%. I thank Raj for this opportunity and focus to channelize our skills through the RBGCD Day. I am very thankful to Raj for this day as we got to meet ourselves more. It is certainly better way to spend time than to hang out with friends. We need to do this more. The experience of interacting with the children was interesting. Thank You for actually giving an opportunity and every minute spent here was worth it. This day is a gift from Raj for all of us and not like other days. The bus journey and the morning exercise prepared us to give our best to the children. I realized that the children are so talented. They know much more and are aware more. Ajeesh (National Level Football Player)- The RBGCD Day Platform was intense and heart felt. Thank You. Spending time with the children made me feel very happy. The RBGCD day was arranged well. The whole RBGCD Day experience was quite good. The children were very involved. I am extremely grateful to this opportunity to go out and do something worthwhile and we need to give back much more. Pranjali Sambhu : (LIC ) The Experience today was wonderful. I learnt how children are very keen to learn new things. Through the RBGCD Day many people are coming together and doing a commendable job. We all want to give back in some way but this platform of the Raj Bhowmik Back To Society helps us to channelize and do our bit fully. I was still fresh at the end of the day. The presence of so many people at the RBGCD Day wanting to do something and moving towards in one direction was too good. The RBGCD Day is a beautiful platform where there are no labels, no strangers, willing to give and not many platforms are so self giving today. Thank You Raj. Bishal (Amity Global Business School): It was great being part of a group. The children were amazing and ready to do things for each other. Children gave easily with confidence. This RBGCD Day is one of the best things that happened in my life. I had no idea the day would be like this and I am grateful to Raj and fortunate as well to being invited. I will join in next year too. The RBGCD Day was a great platform for me to realize that I can give so much. This time it was very well organized as there were more people too. Thank You Raj for this Lifetime opportunity. The RBGCD Day was very close to my heart. Our life is short and it is about giving back and working for others. Thank You. The RBGCD Day overall it was a great experience. The platform provided by RBGCD - Day filled that gap of helping people physically. Thanks for your support and wish you all the best. The children over there were no different than our own children. They enjoyed , participated, learnt had fun all together..the same way as our children do...they were not any different . One thing that touched me most that most of them did not ever see a basket ball & that includes me too...and at that point I felt one with their feels of excitement, curiosity, eagerness to touch , feel & play with the ball. It was a unique experience today. I liked the silent march & was touched to know that this march was carried on in different parts/ sections of the society including HIV+ women.. That made me feel very humble. I would like to participate in giving back to society more often where old people, orphans , homeless , disabled can be reached out more frequently in various ways. Thank You RAJ for giving us an opportunity through this Unique way of giving back To society. I felt very nice & would like to go there & do the same again. I liked the Advertisement activity. I learnt & enjoyed in the group. I saw that the children were very decent over there..very well behaved. 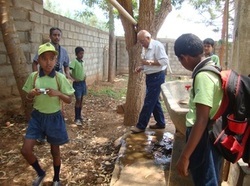 I liked the education imparting activity and I myself doing it with the children. I feel very proud & together with everyone. I did not feel different from any one else . The entire event , so many decently behaved children, the wonderful activities , makes me feel very happy .I would like to thank you for this day and shall be volunteering for any work offered under Giving back to Society. Thank You Raj for this platform. First of all I felt unlimited happiness & satisfied after the RBBTS Annual day got over . I have never participated in any such event ever & I learnt a lot too. Even I came to know a lot through water scarcity and the reason & solutions too. We felt privileged to be a part of such a beautiful . I feel gratitude for the work that we did together on this common platform. I felt grateful to be a part of RBCC so that I could give back to the society through RAJ BHOWMIK BACK TO SOCIETY Annual day . Firstly I would like to extend heart felt Gratitude for this service through education & various educational activities. 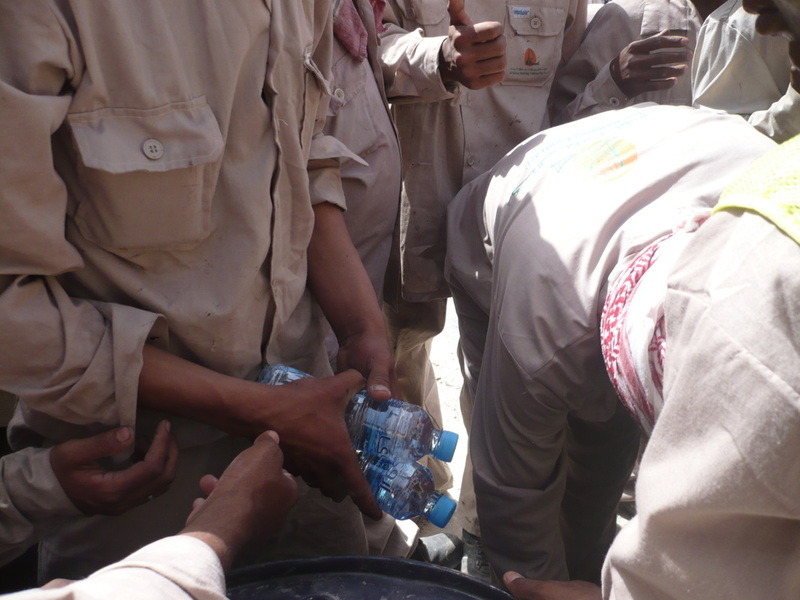 The work was beautifully divided amongst all and would like to hold a similar workshop on water scarcity in my area. That is a thriving problem there. Thumba Thanks to Sri Raj Bhowmik for showing us a beautiful way to serve people under RBBTS day. Would like to participate again & again . First of all I would like to say that I felt privileged for giving me an opportunity to work on such a great platform with so many people, children and so varied activities. I felt that I live each day for my kids , my family , my work ..but today was a day where I lived & worked for others. I loved the Story telling session a lot. I always like to help others in bus , in market etc. but this work is amazing..There were no boundaries. Only team work was there. I learnt that I can carry on helping on others through this unique platform of giving back to the society . I extend my heartfelt gratitude to Sri Raj Bhowmik for providing this opportunity . People's Trust was a beautiful place full with beautiful people . I learnt so much through this unique day . I learnt about hygiene, importance of keeping our area clean, surroundings clean and with collective efforts we can make our community green, mosquito free , no stagnant water etc. I thank Sri Raj Bhowmik for showing me such a beautiful world. I worked and there was no madam & no staff..we felt one. There was so much respect & consideration about each other that I would like to continue participating the same way forever. Now I know how to use our skills & keep children engaged in RBCC when there is chaos during some time. Thank YOU . I felt so much touched by seeing the way we all worked together in spreading education amongst the children. I myself learnt so much & was happy to be a part of such a unique work. Would like to work under this platform called Raj Bhowmik Back To Society forever. Thank You Sri Raj for providing this unique opportunity.. I have purposefully used the word feelings above as I did feel A LOT & thought of nothing during the entire organization & execution of Raj Bhowmik Back to Society Annual Day . I was quite humbled by the fact that i have been chosen as a life organizer of a life event known as Raj Bhowmik Back to Society day. Though secretly wishing for this privilege ever since last year, it was a secret wish coming alive in such a graceful way..How could anyone feel anything else but grateful for the work which I was entrusted with ? The venue decided for the activity had been the same as the last year's event venue- People's Trust - and that moved me so. It is a unique place full of eager , helpful & independent people . They take so much pride in their efforts but are so humble & down to earth too . Their persistent efforts have gradually made them a self sustainable community and thus RBBTS annual day Event day happening in People's Trust village made my heart jump with joy. And it was Gratitude all the way .. beginning from the day when our first meeting was held regarding the planning, till the completion of the event . Completion ..? No ..till a Pause ..to start again..! Thank you for this day coming in such a beautiful way. It was touching to get in touch with people who had participated even last year & had voluntarily come forth with their unique ideas to contribute on this day . Some were very brand new cities / townships which were touched & some of the old ones had reached out to a few more . It was even more touching to see that most of the people assumed that it is a donation drive or something materialistic has to be given , however, I found how the tone of their voices softened when they realized that it was their time & skills with which they had to contribute on that day & monitory givings did not matter much . One of the participants/ A homemaker in Pune said that this is a unique manner to be associated with the section of the society that need our skills most ...! The RBBTS event in Bangalore had attracted volunteers from all the sections of the society and this platform had become a melting pot for the same . It was quite a warm feeling to see that how young & the old , rich & poor, busy Corporate people , business men , homemakers , school children , sport coaches , teachers , retd. personnel , all joined hands today to give back to the society through the skill set & abilities that they have . This was a peace movement and a peace moment at the fullest. No you , No I but just one. This realization swept all through that what am I without all and I am in all as all are in me ... what I had been praying to till now was my Higher self ..my God .. YOU ! With separation melted there was just ONENESS all around ..there was YOU ..MY GOD all around ...in action . Such was the intensity of the Work in Action on the RBBTS Day. THANK YOU for allowing me to meet my GOD yesterday ..my Purpose has started to manifest fully . It is GOD"S work which now I have to carry forward & RBBTS DAY is the platform through which I shall from henceforth work from...and work for...! The planning, organizing & the efforts to make yesterday happen in such a bonded manner , showed the meticulous planning with which every minute thing was taken care of diligently. This is Your work ...It has to be this way & more...The group activity allotted to each lead Volunteer was quite intensely thought of and I could see the excitement in the children , volunteers and the trust people too . The number of children participating in the event had more than doubled & so did the participants too . With Mithra Jyothi school for the blind , Parikrama & Sishu Mandir school for the underprivileged , joining the People's trust children too this time, the group had become a large one and the work was more fun & learnings large ! I learned through all this that this work is beyond feel good factor.. which most of us are looking for in an unrealized stage of our lives . This is REAL doing with full accountability & responsibility . This is love . Thank You Raj for letting me feel LOVE through This unique work . Today was a very different day in my life where I really connected to the purpose of my existence. As I met the children at two different places one group at the People’s Trust and another group at the slums i realized that they are no different to my own child. I could see that all of them understand the language of love and compassion which is beyond boundaries .I could see that all of us share one thing in common the feeling of love when we are ready to give and receive. The smile of each child greeted me with love. This experience was really moving. It showed me that when I truly and completely give back to the place to which I am connected in my existence the joy and energy I get back is limitless.I also realized that when the giving is not associated with a feeling of expecting anything back in return, it gives a feeling of being useful. This feeling is so intense that it only spreads as it cannot be contained. Today when I was with kids showing them some small science experiments and making them realize the importance of water I saw myself in a totally different zone where I received that satisfaction which I never got when I was working with medical and other post graduate professionals teaching them bigger aspects of science. I learnt that in this world of constant run behind receiving each and every moment in our daily life that some time given back to the society will actually fill us and make us wholesome. I just feel like a drop in the vast ocean where I have done what I could do. I feel that today is a day of giving and receiving too. Even before I can even think of what I have given to the society I feel that I have received so much of love and compassion back. To Sri Raj Bhowmik : I am grateful to having been chosen to be a part of your the RBBTS and a day which helps us contribute in our own unique way to the society. I thank you for helping me understand that atleast a day in an year when spent towards giving back gives us the energy and the fulfillment to run in our ever running lives. To just pause , to be ourself and to be a part of this compassion movement which fulfills our life as humans and for having taken birth… it is through this platform that I realized this and I am happy that this will forever in our Life. It was a great experience to reach out to them and give .I felt we all belong to earth and have to collaborate with each other , be helpful . Giving back to society is a part of our big circle of life.which gives completion to the purpose of Life. Many have good intentions to give back but when people come forward together on one Platform like the RBGCD it gives meaning to a Mass action. The Change is big and sustainable. Larger the momentum, more is the Impact. This one day on May 10th RBGCD Day can bring out a change in the minds of people. It can bring out the collaboration and a change in the society. A simple thanks is not enough to express to Sri Raj Bhowmik for giving this Platform. This Platform is really amazing and I am very grateful to him to have started it and given it to every one. There are lot of little ways in which people can contribute through this platform. Many Such little ways make a force .Blesses are we to have it. On My Knees I thank Sri Raj Bhowmik to have allowed me to be a part of this Platform and RBGCD day activity .Thank You Very Much. I would like to do more.